We continue our historical, spooky Halloween posts with a look back at the tragic fire that consumed the Crystal Palace, the impressive glass and metal structure that was located where Bryant Park is today. The Crystal Palace was built in 1853 in the shape of a Greek cross and had a domed roof of 100 feet in diameter to house the World's Fair. The Exhibition of the Industry of All Nations, as it was officially referred to, featured four thousand exhibitors and displayed industrial and consumer goods that were revolutionary at the time, including the newest precision steam engines and mineral resources of the United States. Standing next to the Crystal Palace was the Latting Observatory, which at 315-feet-tall offered unobstructed views of Staten Island, Queens, and New Jersey, and was a major highlight of the fair. The Observatory fell prey to a fire that started at a neighboring shop on 43rd Street in 1856. 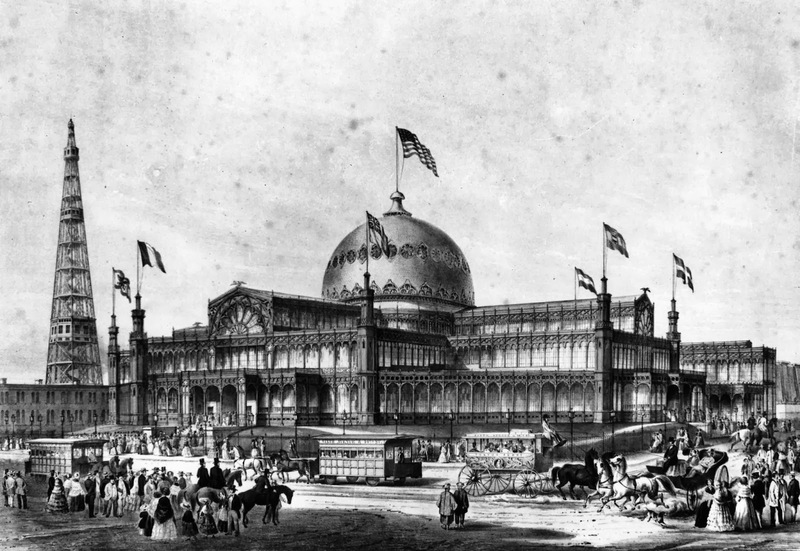 The Crystal Palace, strangely, was also destroyed by a fire, but this time it was no accident. 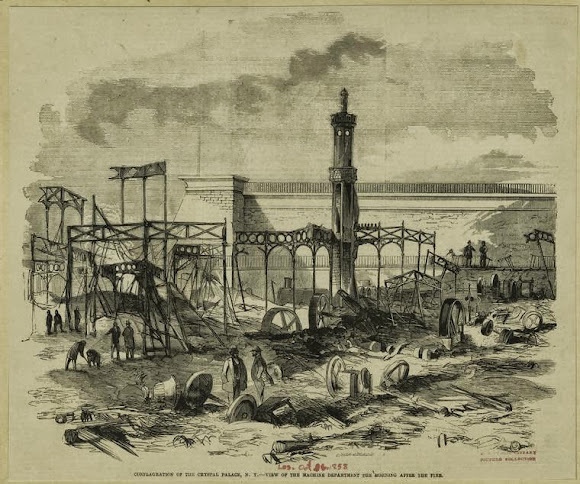 On October 5, 1858, the fire was catalyzed in the lumber room by an arsonist and spread so fiercely that within fifteen minutes, the illustrious dome had fallen, and ten minutes after that, the entire structure was lost. Employees tried to hook up fire hoses when the fire was first noticed, but they found the water pressure ineffective, and the water only trickled out. The fire’s spread was aided by gas light fixtures and wooden staircases that served as a track to the upper galleries. In addition, the paint and chemical exhibits further fueled the raging fire. The flames could be seen from miles around. Two thousand people were inside the building, but no one died in the fire in part, ironically, thanks to the staircase system. The arsonists were never discovered. The only witness testimony that exists is that a group of boys was seen running from the site of the fire’s origin. In addition, some people noted smelling camphene, a highly flammable substance. The structure that brought the World’s Fair to the United States for the first time became a ruined mess of iron and molten glass. The exhibition’s sponsors lost about $300,000 worth of property value and goods in the fire. 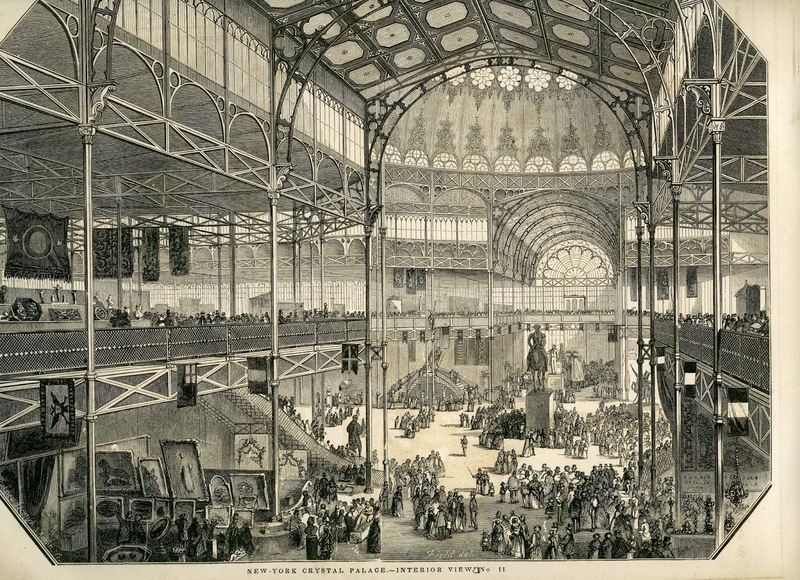 Thus 1858 served as a distinct watershed moment for Midtown Manhattan; numerous economic and industrial developments had taken place during the Crystal Palace’s tenure, which led to an injection of vitality in the area that would inevitably lead to the creation of public spaces such as Bryant Park. The question still remains, however, who lit the flame that set the Manhattan skyline ablaze?